Whilst Rocket League gets lots of free content drops and updates, the developers of the game, Psyonix, regularly release cosmetic crates that include a variety of different aesthetic items. These crates do cost money to open, but they drop regularly as you play the game. If you're looking to open some Rocket League crates, but you don't know which ones are worth opening, take a read through the guide below. 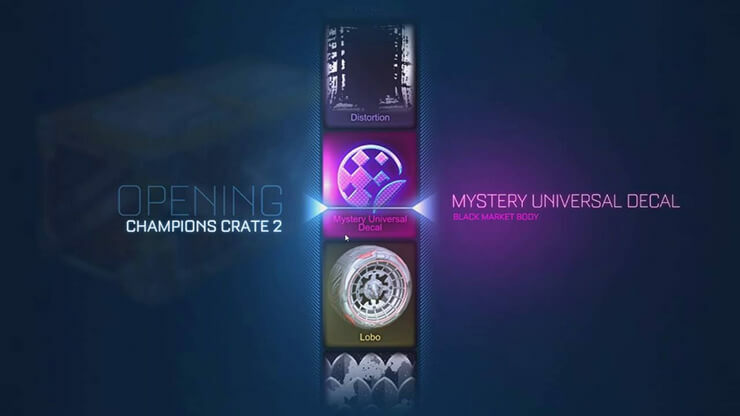 One thing to keep in mind about the different Rocket League crates is that each crate has good items and mediocre items. The difficult part is that all of the good items are very rare. The chance to get the best items from the crates in Rocket League is very small. With that being said, there are certain crates that the community seems to prefer, mostly because the items that can be found in these crates look better than the items from other crates. Below, we've taken a look at the top three crates the Rocket League community considers to be the best. The Rocket League Overdrive Crate is perhaps the most popular crate currently available in the game. This crate has a number of extremely rare Black Market goal explosions, as well as some Exotic rarity wheels, and two Import bodies. 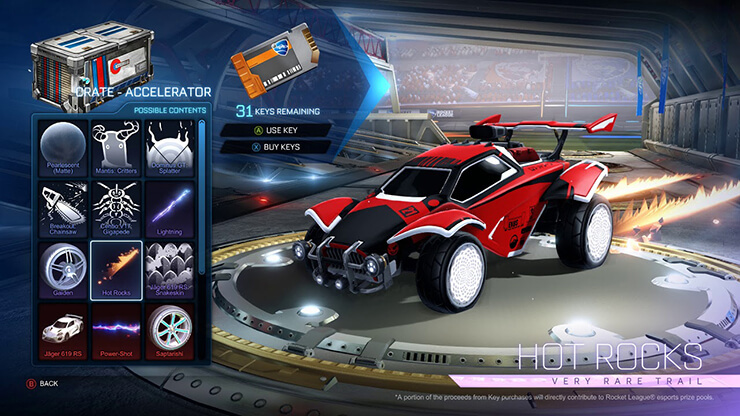 Perhaps one of the most sought-after item in the Overdrive crate is the Hellfire Goal Explosion. With this, a giant fiery skull explodes onto the field when you get a goal. It's incredibly rare though, and some would say it has a 1-3% drop rate. There are a number of items in the Overdrive crates that are a little easier to get hold of. Examples would include the Friction, Lightspeed, and Blazer trails, all of which are classed as Very Rare items. There are also a few Rare metallic paint finishes and decals within the Overdrive crate that are liked within the Rocket League community. Another case that a lot of Rocket League players like is the Accelerator Case. This case also has the epic Hellfire goal explosion, but it has a number of even more impressive goal explosions that cannot be found elsewhere. Firstly, we have the Popcorn goal explosion - with this, big popcorn kernels fly into the sky when a goal is scored. The party goal explosion is great, as well. This item will make party balloons appear and fly into the sky when a goal is scored. One of the biggest reasons why the Accelerator case is loved so much comes down to the Exotic wheels available inside. These items, which have a slightly higher chance to drop than the goal explosions mentioned above, are some of the most colorful, unique wheels available in Rocket League. 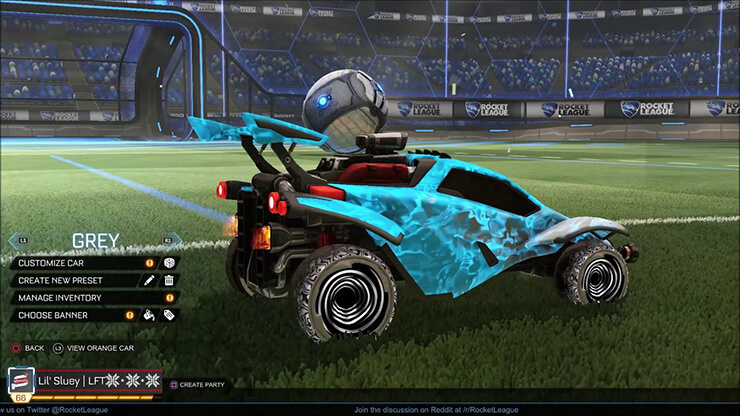 There are three in total: the Chrono wheels, the Clockwork wheels, and the Saptarishi wheels. The Triumph crate is one of the newest crates in Rocket League right now. As a result, it's getting a lot of attention from the community. There are a total of four Black Market goal explosions in the Triumph crate. This includes the Dissolver, the Atomizer, the Toon, and the Storm Watch. Because they are so rare and the Triumph crate is so new, finding footage of these can be very difficult. 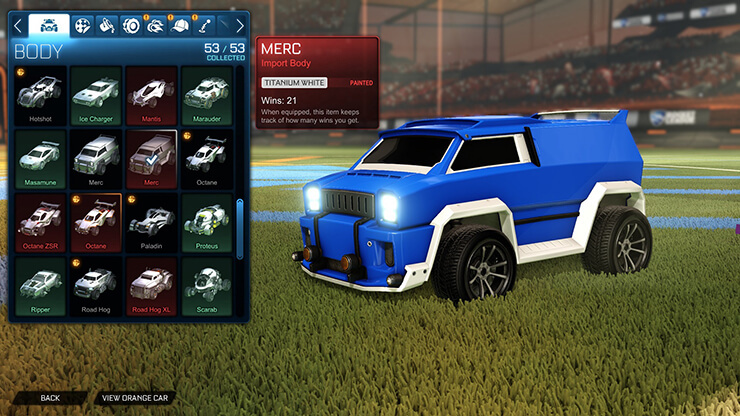 There are also two very impressive Exotic wheels in the Triumph crate. We have the Hypnotik wheel, which looks like a mini time vortex inside the wheel. We also have the REEVRB, which is a large, chunky metallic wheel. Hopefully, more gameplay with the Triumph crate will be put online very soon. Why Do Rocket League Crates Cost Money To Open? One of the biggest complaints we've heard about Rocket League crates is that they're expensive to open. Each key costs $1.49 and most of the time that key will open a crate and get you a pretty mediocre item. You usually have to spend a lot of money before you get an Exotic or Black Market item - by that point, you will have spent far more on keys than you would have spent on the actual game. There are two reasons why the Rocket League crates cost so much money to open. 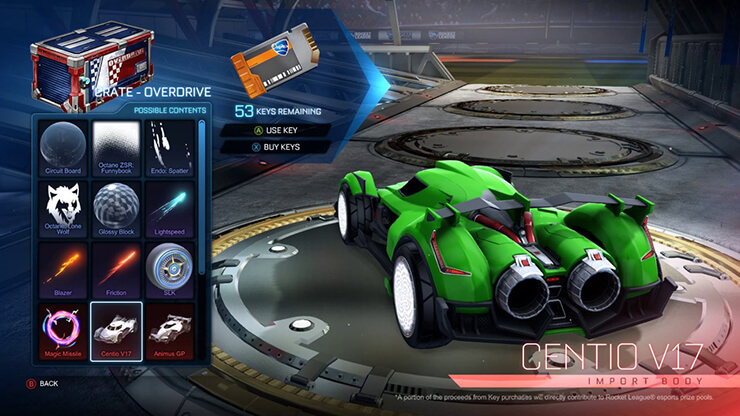 Firstly, Rocket League crates help to fund the developer's ongoing development costs. Whilst Rocket League is essentially a finished game at this point, the developers still need to pay for server hosting. The Rocket League developers also regularly release new content and new game modes. This takes time and costs money, so the ongoing revenue from Rocket League crates help to keep development going smoothly. Rocket League crates also help to fund the Rocket League esports scene. Each key that is bought will have a portion of its money go to helping build up prize pools for different esports tournaments. Without this system in place, the Rocket League esports scene may not have become as big as it is today. The Rocket League competitive scene is still growing, and financial support from the crate system helps to keep it alive. If you don't want to spend money opening crates, there are a number of other options you go can for. For example, there are many online trading communities that let Rocket League players trade their items for keys. This means you can buy keys and then use those keys to trade for the exact items you want. With this method, you may be paying more up front to get enough keys to get an Exotic or Black Market item, but you'll be guaranteeing yourself the item you'd like. You could also consider earning Steam wallet funds without spending any money at all. With this method, you can continue to open keys but you will be spending Steam wallet funds that you didn't pay for. You can learn more about how you can earn free gift cards for Steam wallet funds or other online gift cards by reading the information below this blog. What are your thoughts on the crates in Rocket League? Do you think it's good that Rocket League items can't be purchased on the Steam community market like other games?